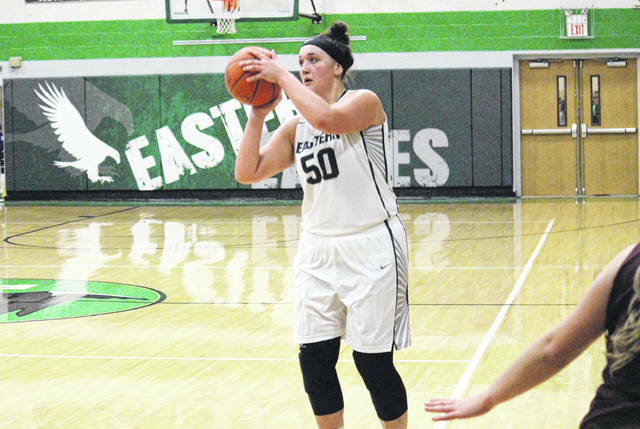 Eastern senior Elizabeth Collins (50) lines up a successful three-pointer during the first half of the Lady Eagles’ 71-70 victory on Wednesday in Tuppers Plains, Ohio. Meigs senior Madison Hendricks (right) shoots a three-pointer over EHS junior Kelsey Casto (left), during the fourth quarter of Eastern’s 72-71 win on Wednesday in Tuppers Plains, Ohio. TUPPERS PLAINS, Ohio — As close as it gets. 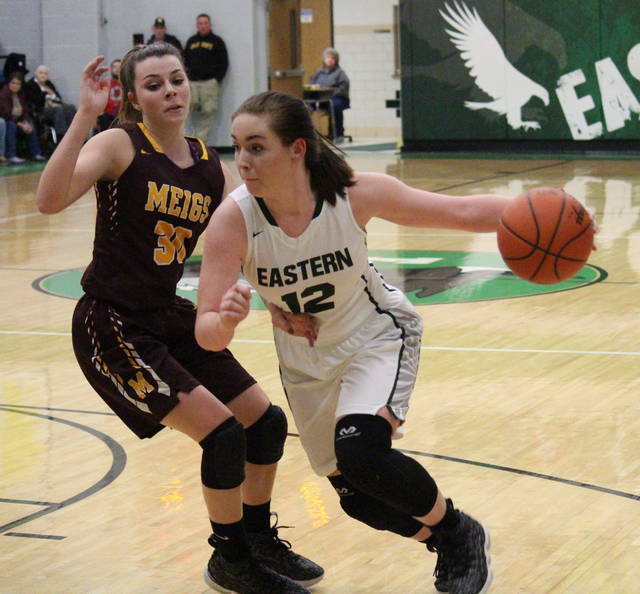 The Eastern girls basketball team defended ‘The Nest’ on Wednesday night, defeating Meigs by a 71-70 count in non-conference play. The Lady Marauders (8-8) lead initially and pushed their advantage to as high as eight points, at 11-3, 3:30 into play. Eastern (9-5) scored the next nine points, however, and took its first lead with 1:24 left in the first quarter. Meigs briefly regained the advantage at 13-12, but the Lady Eagles were ahead 17-15 by the time the first quarter concluded. The hosts scored the first nine points of the second quarter, before Meigs answered with a 6-to-2 run to trim its deficit to 28-21 with 4:00 left in the period. Eastern outscored the Maroon and Gold 10-to-6 over the remainder of the half and headed into the break with a 38-27 edge. 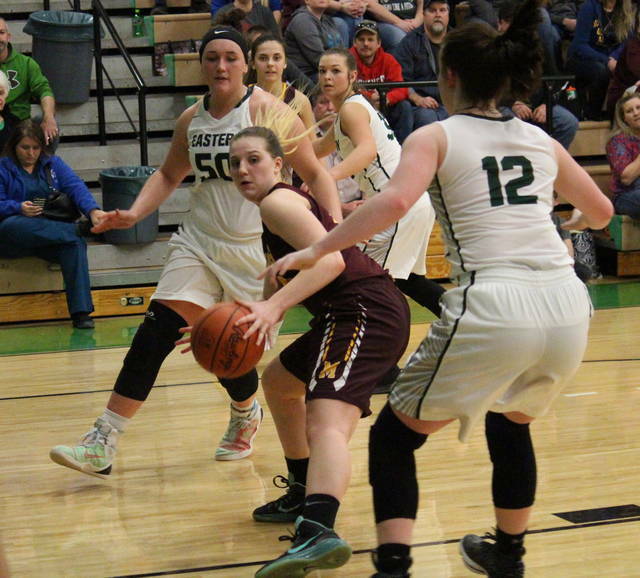 The EHS lead was at a game-high 13 points three separate times in the early part of the third quarter, but Meigs roared back to take a 49-48 lead with 1:20 left in the stanza. EHS regained the lead at 51-49, but surrendered five unanswered points, giving the guests a 54-51 edge with eight minutes to play. The Lady Eagles took the lead back, at 58-56, with 4:27 left in the game, and Meigs never regained the advantage. The Maroon and Gold tied the game at 58 and 61, but a 10-to-3 EHS run gave the Lady Eagles a 71-64 edge with 1:19 to go. The Lady Marauders hit a three-pointer with 47 seconds left and another triple with five seconds to play, but couldn’t get another shot off, as EHS claimed the 71-70 win. The Lady Eagles shot 23-of-44 (52.3 percent) from the field, including 6-of-15 (40 percent) from beyond the arc. Meigs connected on 26-of-62 (41.9 percent) field goal tries, including 12-of-27 (44.4 percent) three-point tries. From the free throw line, EHS shot 19-of-37 (51.4 percent) and MHS shot 6-of-9 (66.7 percent). 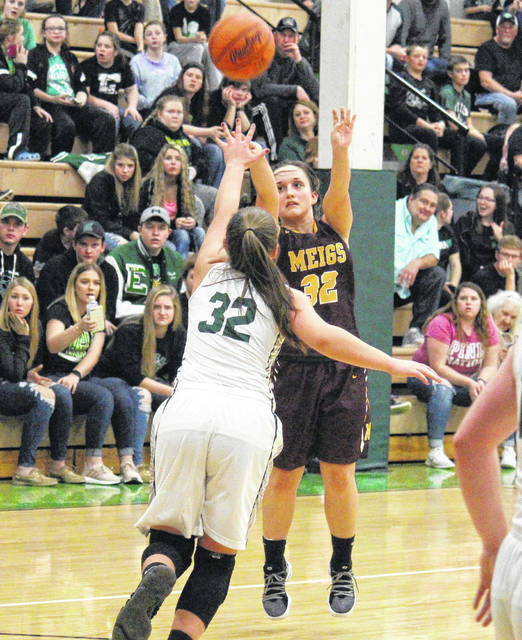 The Lady Eagles outrebounded Meigs by a 37-to-24 tally, including 11-to-10 on the offensive glass. Eastern also claimed a narrow 18-to-17 edge in assists, while the Lady Marauders earned advantages of 9-to-5 in steals and 3-to-2 in blocked shots. After turning the ball over just six times in the opening half, Eastern gave the ball away 13 times in the second half. In total, the Lady Marauders turned the ball over 12 times, seven of which came in the second half. The Lady Eagles were led by senior Elizabeth Collins, who posted a double-double of 20 points and 11 rebounds. Alyson Bailey hit a team-best three trifectas and finished with 19 points, while Madison Williams had a double-double of 15 points and 10 rebounds, to go with a game-high seven assists. EHS junior Jess Parker scored 10 points, eight of which came from the free throw line. Kelsey Casto contributed four points to the winning cause, while Kaitlyn Hawk chipped in with three points. The Lady Eagle defense was led by Bailey with three steals, followed by Collins with two blocks and one steal. The MHS offense was led by Madison Hendricks and Kassidy Betzing with 18 points apiece, with Hendricks making a trio of three-pointers and Betzing adding two triples. Becca Pullins scored 14 points and dished out a team-best six assists, while Devin Humphreys added 10 points to the MHS total. Marissa Noble and Madison Fields rounded out the scoring column for the guests with five points apiece. Betzing led the Lady Marauder defense with seven steals, while Humphreys blocked three shots. This is the lone scheduled meeting between these teams this season. After Eastern hosts Belpre on Thursday, the Lady Eagles will visit Miller on Saturday. After Meigs travels to River Valley on Thursday, the Lady Marauders will be back in action on Monday at Vinton County.